Does America Need A Strong Dollar Policy? Is a strong dollar good or overrated as a policy goal? Financial experts face off over what's in your wallet, in the latest Intelligence Squared U.S. debate. (From left) John Taylor, Frederic Mishkin, James Grant and Steve Forbes traded arguments during the latest Intelligence Squared U.S. debate. Is a strong U.S. dollar a good thing, or is it overrated as a policy goal? Some argue that a policy aimed at keeping the dollar strong would hurt U.S. economic growth because it would make American goods and services more expensive, lessening global demand for them. Others say having a weak and unstable unit as the basis of the economy makes commerce harder and creates financial bubbles that then burst disastrously. 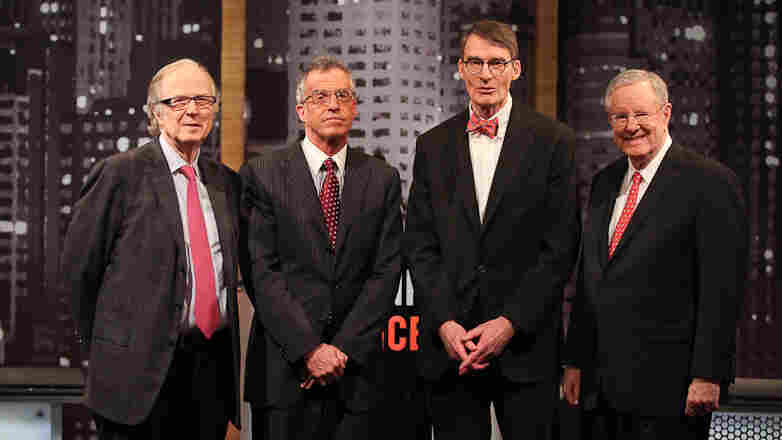 Four financial experts recently took on the topic in an Intelligence Squared U.S. debate, facing off two against two on the motion: "America Doesn't Need a Strong Dollar Policy." Before the Oxford-style debate, the audience voted 24 percent in favor of that motion, while 29 percent were against and 47 percent were undecided. Afterward, 54 percent of the audience agreed that the U.S. doesn't need a strong dollar policy, while 37 percent disagreed — making the side arguing in favor of the motion the winners. Frederic Mishkin is the Alfred Lerner professor of banking and financial institutions at Columbia Business School. He is also a research associate at the National Bureau of Economic Research, a member of the Squam Lake Working Group on Financial Regulation, and the co-director of the U.S. Monetary Policy Forum. From September 2006 to August 2008, he was a member of the Board of Governors of the Federal Reserve System. He has also been a senior fellow at the FDIC Center for Banking Research, and past president of the Eastern Economic Association. He has taught at the University of Chicago, Northwestern University and Princeton University. From 1994 to 1997, he was executive vice president and director of research at the Federal Reserve Bank of New York and an associate economist of the Federal Open Market Committee of the Federal Reserve System. 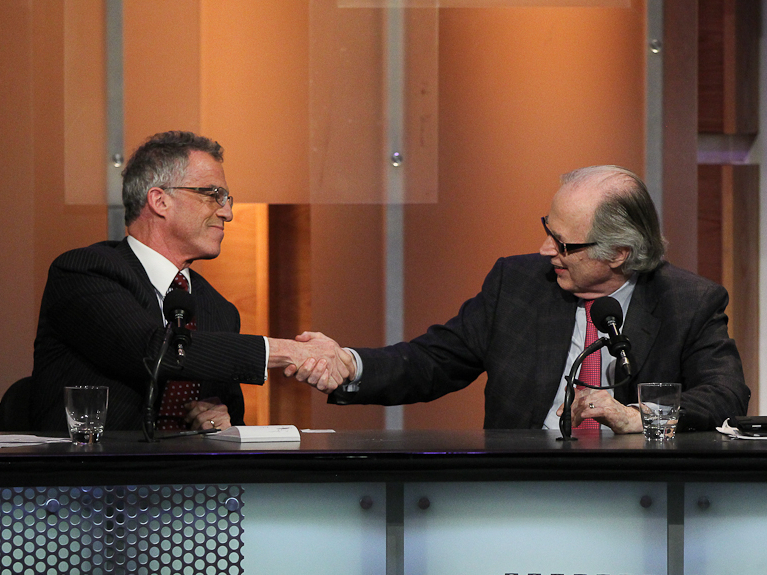 Debaters Frederic Mishkin and John Taylor celebrate their win after arguing that the U.S. doesn't need a strong dollar policy. John Taylor is the chairman and founder of FX Concepts, a multifaceted investment management company, which today manages more than $4 billion in currency absolute return and overlay strategies. Taylor has written numerous articles in investment journals and is often quoted in the popular press on financial topics. Before starting FX Concepts, Taylor was a vice president at Citibank, where he was the head of the bank's marketing, advisory services and research for foreign exchange. Taylor is also a founder and former chairman of Franklin University Switzerland in Lugano, Switzerland, and the chairman of Inspiration Biopharmaceuticals, a development stage biotech company. Steve Forbes is chairman and editor-in-chief of Forbes Media. Forbes writes editorials for each issue of Forbes under the heading "Fact and Comment." He is the only writer to have won the Crystal Owl Award for economic prognostication four times. In both 1996 and 2000, Forbes campaigned for the Republican nomination for the presidency. Forbes is the author of Freedom Manifesto: Why Free Markets Are Moral and Big Government Isn't (2012). Forbes serves on the boards of the Ronald Reagan Presidential Foundation, the Heritage Foundation and the Foundation for Defense of Democracies. He is on the Board of Overseers of the Memorial Sloan-Kettering Cancer Center and on the Board of Visitors for the School of Public Policy of Pepperdine University. He previously served on the Board of Trustees of Princeton University for 10 years. James Grant is the editor and founder of Grant's Interest Rate Observer, a twice-monthly journal of the financial markets. Grant originated the "Current Yield" column in Barron's before founding Grant's Interest Rate Observer in 1983. He is the author of five books on finance and financial history, including Money of the Mind (1992) and Mr. Market Miscalculates (2008). His biography of the second president of the United States, John Adams: Party of One, was published in 2005. Grant's television appearances include 60 Minutes, The NewsHour with Jim Lehrer, CBS Evening News and a 10-year stint on Wall Street Week. His journalism has appeared in a variety of periodicals, including the Financial Times, The Wall Street Journal and Foreign Affairs.